At the turn of the twentieth century, there were three major freight carriers serving Philadelphia: The Pennsylvania Railroad, the Reading Company (both headquartered in the city) and The Baltimore and Ohio. At the turn of the twenty first century, there were still three major freight carriers serving Philadelphia. 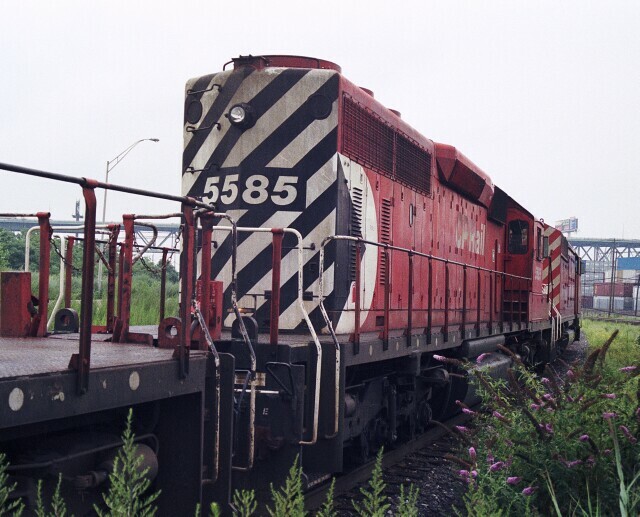 Norfolk Southern (which had assumed most of the former PRR assets and some RDG assets in the Conrail split) and CSX (successor to the B&O that acquired some RDG assets in the split), had the lion's share of the traffic, but thanks to operating rights gained in the acquistion of the Delaware and Hudson Railway, Canadian Pacific also ran trains into the port of Philadelphia by way of NS trackage. 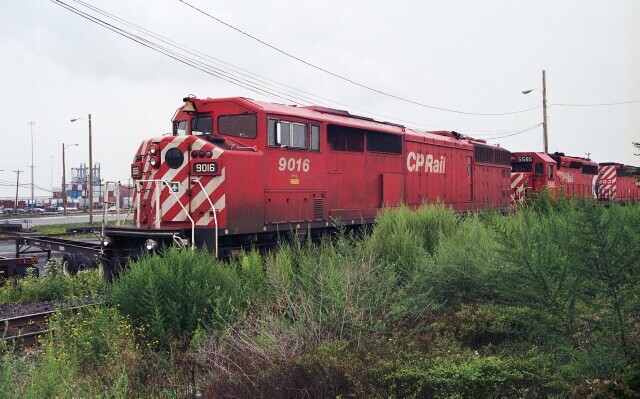 Within spitting distance of the Walt Whitman Bridge, the Canadian Pacific power, like this trio of EMD road units, could often be found in the wilds of South Philly, resting between runs along Delware Avenue just outside Greenwich Yard. A rare visitor to these parts, SD40-2F CP 9016 in the Action Red paint scheme is one of 25 "red barn" full cowl units built exclusively for CP. 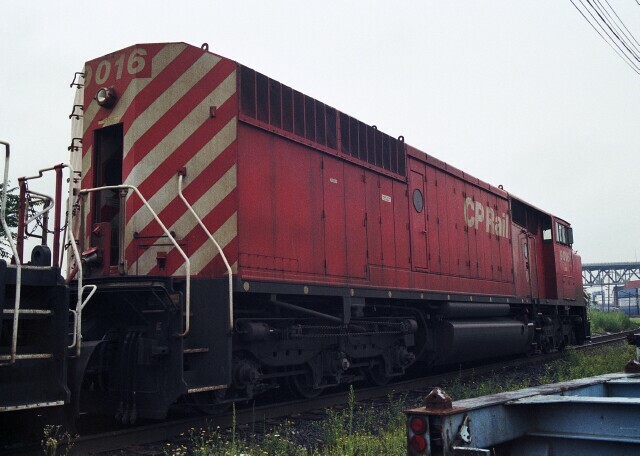 The rare visitor is also a rare bird as there have been only a couple hundred full cowl freight units built during the last few decades of the twentieth century, mostly for Canadian railroads. The design was intended to provide protection for the crews from the harsh winter weather, but made reverse operation from the cab difficult. 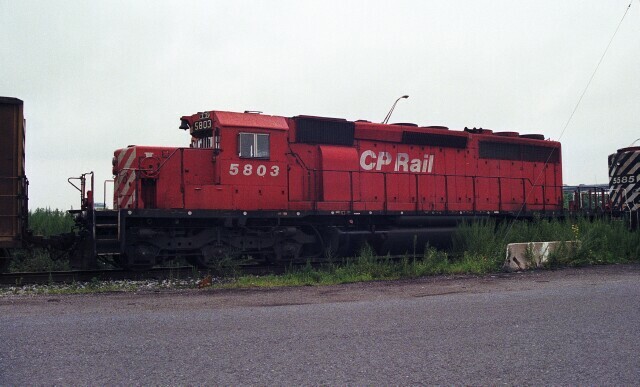 and plain jane CP 5803 in Action Red scheme. 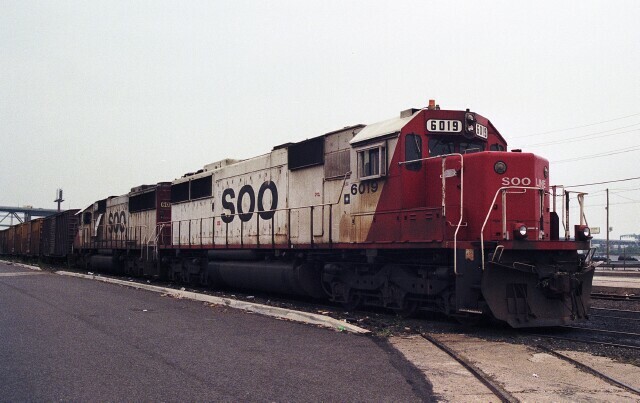 Along with CP power, other engines in the CP corporate family would occasionally visit, such as this pair of Soo Line SD60's, SOO 6019 and 6023, stopped on Delaware Avenue. By the end of the decade, 6019 would be wearing CEFX Blue but 6023 would still say SOO until it was renumbered CP 6223 in 2012. 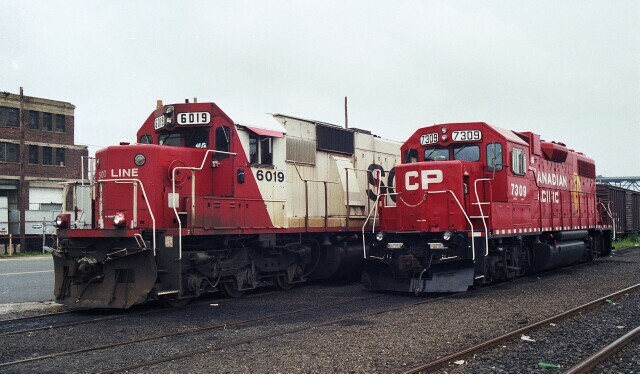 Alongside 6019 and 6023, local power and former D&H GP38-2 CP 7309 sports the Golden Beaver paint scheme.